Shuffling down the line with the One Less Lonely Collection is "Baby" Blue, a lovely blue creme that is as pretty as the sky. 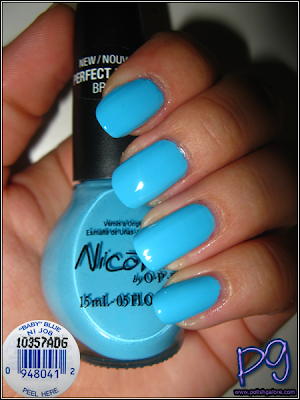 I used a base coat of OPI Natural Nail, 3 coats of "Baby" Blue and a top of OPI Top Coat. I need to do something about those pesky ridges. You can see how well this applies as well as how bright it is. Even in the shade, it's a nice opaque blue that really pops. Indoors with the flash and my nails are nearly glowing! Now I have to stop singing "Baby" in my head and go stare at my nails. Definitely a keeper for my stash. oooh very nice. i recently started getting horizontal ridges on my thumbs and can't figure out where it's coming from! It's driving me crazy!